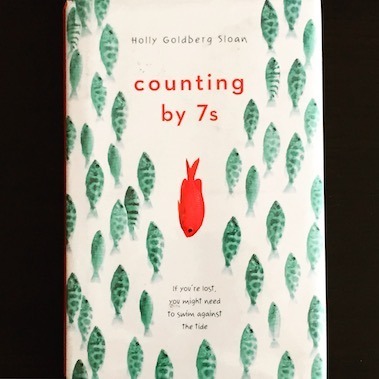 Counting By 7s by Holly Goldberg Sloan was a popular book in my 5th grade class last year. It was one of those books that students asked to read even though it was above most of their reading levels. Intended for students in grade 5 and up, Counting By 7s is the remarkable story about Willow Chance, a 12-year-old genius whose adoptive parents are killed in a car accident at the very beginning of the story. Though Willow is highly intelligent, she has a difficult time navigating social interactions. To say that she is misunderstood is an understatement. For example, she aces a school test, and is then recommended for counseling because the administration thinks she cheated. At the same time, Willow is unusual. She learns Vietnamese in order to impress a new friend, Mai. She is an expert botanist, with an unprecedented appreciation for plants. Through the story the reader is challenged to examine the little things, or perhaps the more subtle things, in life. Willow moves in with Mai, her mother Pattie and her brother Quang-ha. Pattie is a strong woman who owns her own nail salon. She wishes the only color nail polish they used was red, since it symbolizes luck. Pattie shows us that sometimes you have to take a chance and open your heart, and in this case home, to someone in need. Throughout the story, she provides the voice of reason. She responds to challenges quickly and with confidence. Pattie says, “What we expect rarely occurs; what we don’t expect is what happens,” which summarizes not only what is happening in the story, but what happens in our lives. A few weeks ago, I wrote a review about The Book Thief and I said, if you read just one more book…, well now I’m revising that to say, please read two more books. Holly Goldberg Sloan brings to life several complex characters in this heartbreaking then heart-mending story. This is a story about life and loss, friendship and love, and having the strength and courage to move forward.